From the McPalin's strong economy department... Thanks to Fresh Boy Crew for the heads up! 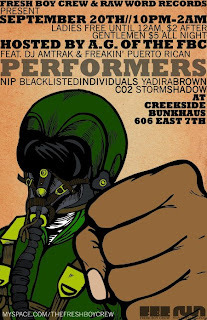 Nip, Blacklisted Individuals, Yadira Brown, CO2, Stormshadow, DJ Amtrak & Freakin' Puerto Rican @ Creekside Bunk Haus on Sept. 20th. Man, something's amiss when 100+ year old companies are dropping like flies. Lehman Brothers, AIG, Bear Sterns... someone done fucked up. I'm just saying, if this were the streets, someone would be bending down for the soap with all the money that's been "lost".